Founded in 1958 at the height of the Cold War, CND is Britain’s best known peace movement. Reigate and Redhill Peace/CND group representative David Hilder said: “That CND’s logo became an internationally recognised symbol of peace is a reflection of the strength of the peace movement, particularly here in Britain, and the arguments it has made for peace and against nuclear weapons over the last six decades. “You can travel to any part of the globe, show people the symbol and it is instantly recognised and its meaning understood. Here in Britain, people see the logo and it reminds them of stories passed down in families like ‘My grandmother was on the first London to Aldermaston march against nuclear weapons in 1958’. For others they are reminded of the Greenham Common Women’s Peace Camp in the 1980s, and for younger activists it is associated with new political leaders who have come to prominence as campaigners against nuclear weapons, like Jeremy Corbyn, Nicola Sturgeon, Caroline Lucas, and Leanne Wood. “Situating the symbol in Reigate’s Priory Park invites members of the public here in Reigate to share their own stories and concerns. 60 years on from the birth of CND, at a time when nuclear war seems more likely than ever, the symbol is an opportunity for us all to think about the role of civil society organisations, the renewed need for them to hold governments to account, as well as thinking about how we can build a world free of nuclear weapons. 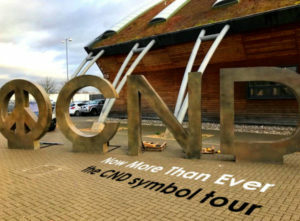 “We invite everyone to say hello, to take photos, chat with local CND members, learn why CND is now needed more than ever, and share their concerns and fears”. The installation will appear at the Reigate Priory Park, Bell Street on Sunday 15th April between 10am and 6pm. It measures just over 9 metres long and 2.4 metres high. East Surrey Green Party is affiliated to Reigate and Redhill Peace/CND group.